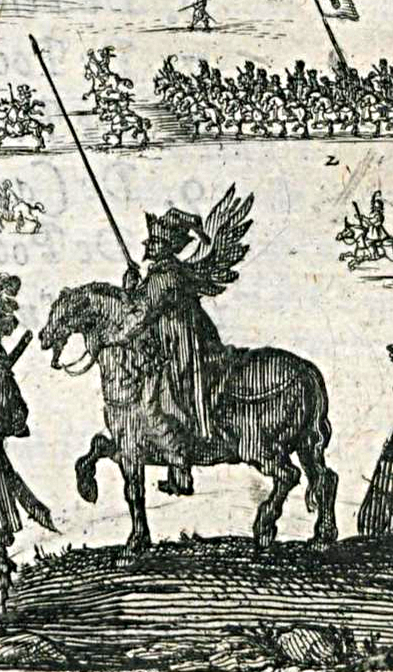 I have been curious about the winged horsearcher sketched, amongst the whole array of our Polish army soldiers, by a Dutch artist Abraham van Booth circa 1627, and then engraved and published in the Iournael, van de legatie, gedaen in de iaren 1627 en 1628. He perhaps is an elear that 'worked' before a winged hussar banner/company, sort of 'clearing' the way. ''Elear - 'elier,' 'halier,' 'harcownik' (skirmisher), soldier who proceed an army before the battle, soldier sent forward to give the enemy a quarrel [fight]. From Latin - eligere." Then he quoted - " Eliers or haliers the best cavalry[men] were called, chosen from the entire army; who to cause the sensation of fear [amongst the enemy] while as a sign of better understanding [between themselves] with red ''binda'' or ''nałęcza'' (scarf) their chests diagonally girdled." Another scholar Marian Czapski, working in the second half of XIX century, in his work titled ''Historya Konia'' (The History of Horse) talks about the elears in volume II, drawing the name from a Hungarian word 'elore' that was to meant 'forward' thus perhaps this was a type of a skirmisher? 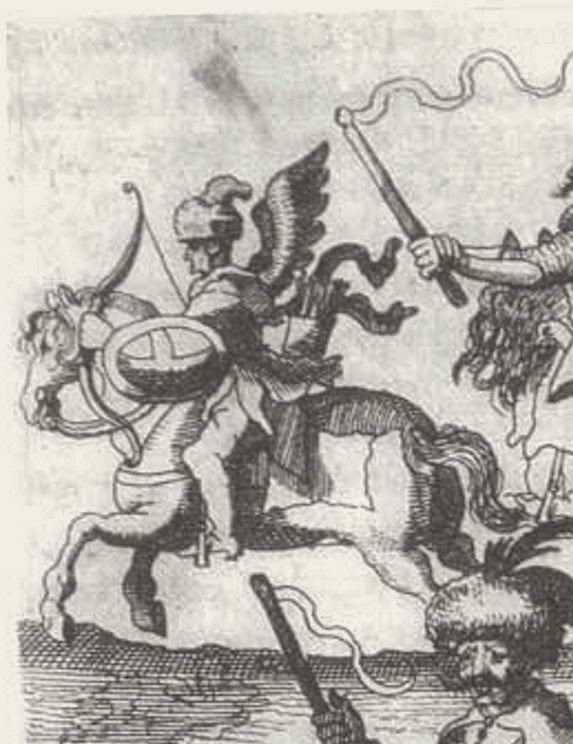 During the Rokosz Zebrzydowskiego (in 1607) at the battle of Guzów the bravest soldiers were called elears and grouped together so when they charged the royal lines and penetrated them deeply, and one famous horseman amongst thus grouped elears of Janusz Radziwiłł (anti-royal camp) named Hołownia went as far as the royal tent shouting ''Where is the Swede" (the King was of Swedish origin) and there he paid the highest price for his daring and 'laesa maiestas' by being killed. 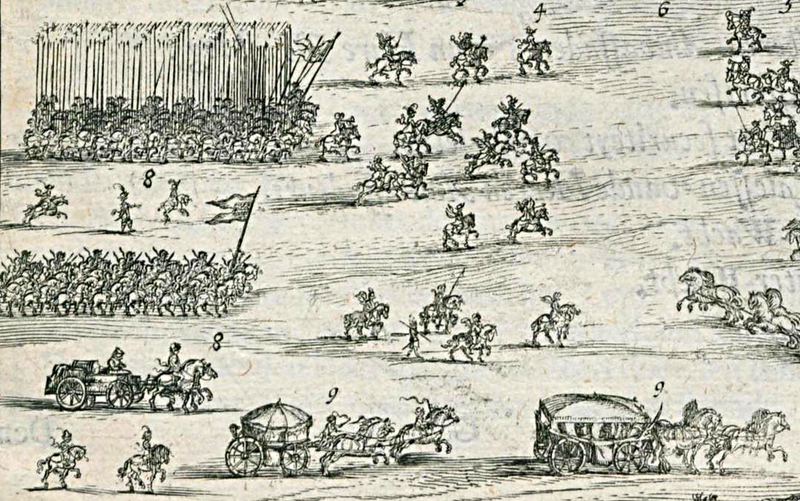 Amongst the modern scholars, Richard Brzeziński, in his groundbreaking work ('Polish Winged Hussar 1576-1775') in addition to discussing the elears in winged hussars' companies, provides two images from van Booth's 'Journael van de Legatie' (Amsterdam 1632) - an engraved drawing and a black-white watercolour (one day I will turn to it in order to do some drawings etc). Eliari dicti praestantiores equites ex toto exercitu selecti, ad audactorem impressionem faciendam, pro tenerra humeros rubris fasciis praecincti. (Paweł Piasecki, Kronika, describing the Polish elears at battle of Bucov on the River of Teleaeyn in 1600). Imci pan Marian Czapski w ''Historii konia'' tom II pisze, że nazwa mogła także pochodzić od wegierskiej komendy ''elöre'' czyli 'naprzód' (strona 458). 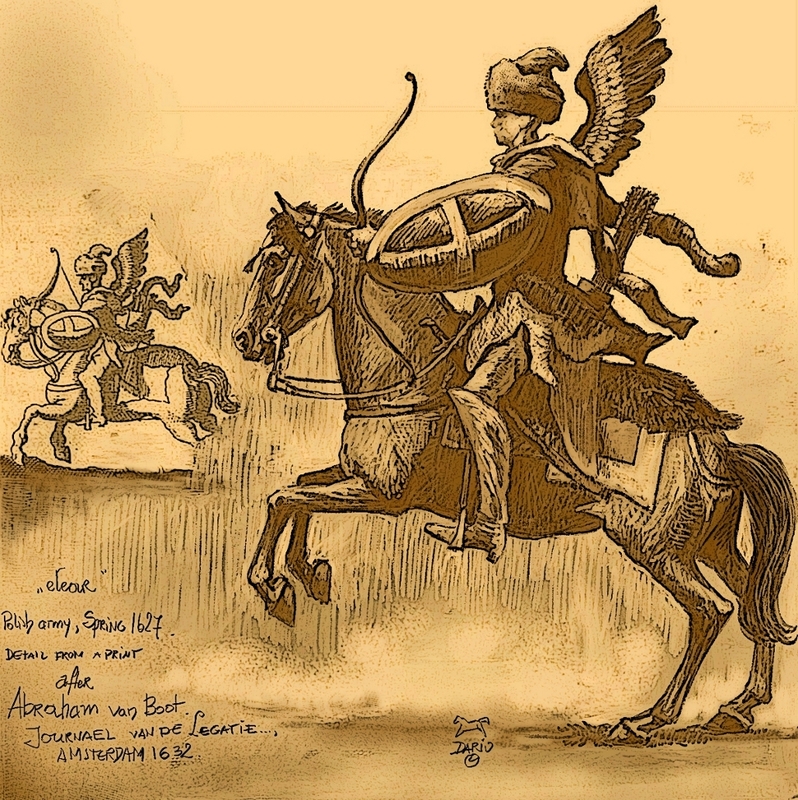 O elearach, z ikonografią, w husarii pisze imci pan Richard Brzeziński w ''Polish Winged Hussar.''. Now, the shield in the engraving looks a bit like the one carried by the Irish or like the English horsemen in Ireland during the late XVI century campaigns. The watercolour does not have this roundish shield, nor does the second elear sketched and engraved in the published journal.